What is the fake load? False load is a necessary tool for power maintenance, It is better to use electric furnace wire self-made false load for power maintenance. The false load is used to measure the output power of the power supply after maintenance to ensure that it is really available. This is because for a normal power supply, it is not enough to be able to output the target voltages of each group (there will be no difference between the measured output voltage of many fault sources at no load and the measured output voltage of the normal power supply). It should also be ensured that it can drive a load that corresponds to the load specified in the power supply nameplate. For power, "load" is a power concept. For example, the power of ATX power supply is usually divided into 150W, 200W, 250W, 300W, even as high as 1000W and so on. According to the direction of power input and output, the ATX power supply actually has power in two directions: AC power input from AC 220V to ATX power supply. This power can be calculated after measuring the data on the AC side: the DC power output from the ATX power supply to the load, and this power can also be calculated from the DC side measurement data. So, can we use some kind of load (such as electric wire) to self-make one or some of the fake loads that we can use for maintenance and learning? The answer is yes. The false load made by electric furnace wire has the advantages of safety, low cost and flexibility. The production process is as follows. Buy some electric wire, set the adjustable output voltage to 3.3V, 5V or 12V, connect the positive pole of the adjustable power supply to one end of the electric furnace wire, and then select a point in the middle section of the electric furnace wire to connect to the adjustable negative pole. Observe the adjustable actual output current. 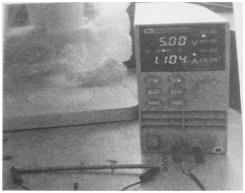 If the actual output current is greater than the target current, the electric furnace wire between the adjustable positive and negative poles is too short; if the actual output current is less than the target current, the electric furnace wire between the adjustable positive and negative poles is too long. 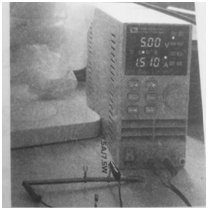 By continuously observing and adjusting the length of the furnace wire, pure resistor false loads with different current (power) can be obtained. Fig. 1 shows a false load for measuring the actual output power of the 5VSB for the 2A/10W. Its power is the same as that of 2.041x5=10 (W). The false load for measuring the actual output power of the 5VSB is shown in fig. 2 for the 2A/7.5W. Fig. 3 shows a false load for measuring the actual output power of the 1A/5W for the 5VSB. 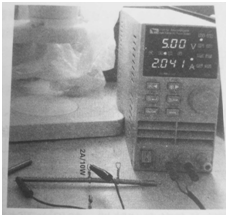 The author actually used a fixed copper ring to intercept a certain length of electric furnace wire as a load (its power has been measured and calibrated). Interested readers can even change the fixed copper ring to a mobile copper ring so that the power of such self-made fake loads can be continuously adjustable, that is to say, a continuous power load. Fig. 4 is a false load for measuring the actual output power of an ATX12V made by the author using a 3500W electric furnace wire. Figure4. False load to measure the actual output power of the ATX12V. Why the real desktop computer is not used as a load to more intuitively determine whether the fixed power supply is available? Is the self-made fake load an addition to the painting? This is because the above false load in-depth exploration of the power supply feedback and over-current, over-voltage, under-voltage protection circuit functions are irreplaceable.